Whilst preparing for a trip to Colorado, I decided to look around for waterproof camera bags in anticipation of the December weather in the Rocky Mountains National Park, ie, snow! I had been thinking of getting a waterproof backpack for quite a while, I remember only too well having my camera equipment continually soaked in British Columbia during an October trip with a LowePro backpack and although everything survived on that occasion, I wouldn’t want to repeat the experience with a backpack used beyond it’s remit. A waterproof backpack was what I wanted. Having looked around at various LowePro and Tamrac bags, I couldn’t find anything that completely satisfied my needs. I confess to being very difficult to please when it comes to camera bags and backpacks, I generally do not like any of them for various reasons and I usually prefer to carry my cameras wrapped in lightweight Exped drybags inside a daysack rather than dedicated camera bags. I still needed a waterproof camera backpack that would carry my landscape and travel camera gear and fit easily within all major cabin baggage criteria, though. Most canoeists, kayakers and cycle tourists will be familiar with Ortlieb products. For many years Ortlieb have set the benchmark in drybags and waterproof panniers, I’ve used them myself for years and I’m very familiar with the workmanship and materials that are the Ortlieb trademark. After checking the specifications on the Ortlieb website the Day-Shot looked promising. What was less attractive was the average rrp at over £225. A check on the big auction site threw up a couple of new bags for sale and one was priced as BiN at £103 with free p&p, which seemed more promising! I bought it and when it arrived, it was as described: new, unused, still sealed in a polythene bag with all swing tickets attached and silica gel packets inside. The Day-Shot has quite a neat profile with a side entry. The tripod carrier is not the best or most secure design, it does move around quite a lot and it’s impossible to secure the tripod completely. With my Gitzo 1550T Traveller, I find it works best when inside the carrier flap and two legs are slightly extended to take up some of the slack. 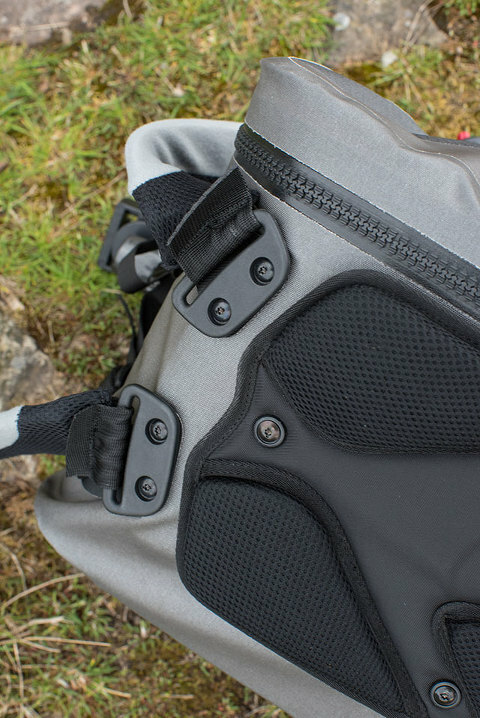 Having the tripod inside the flap means that the concealed mesh pocket on the back of the flap is not really usable. 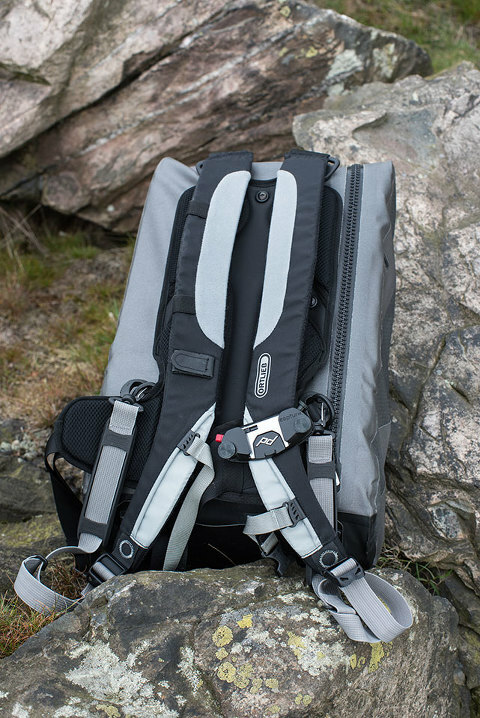 The carrying harness is quite effective, but not as good or as comfortable as a LowePro backpack. This is one area where compromises and shortcomings are going to be revealed very quickly and my main gripe is with the carrying position of the backpack being very low on my back, the bottom of the bag seems to be somewhere around the level of my upper coccyx and the top of the bag somewhere between my shoulder blades. I would prefer the carrying position to be much higher up on my back, even with the shoulder straps cinched down much more than should be necessary, the pack was too low and the hip belt also has to tightened quite a bit to keep the pack high. The chest strap is also constantly needed to stabilise the harness as the shoulder straps do have a tendency to ‘open’ out right to the edges of my shoulder joints. When straps and belts have to be adjusted to these extremes, the carrying system is poorly designed and the Day-Shot harness would benefit from a complete re-design in my opinion. That said, it is still better than many other camera-specific backpacks I have used during my career. The back of the pack is well padded with foam padding and quick-drying mesh and the attention to workmanship and materials is up to the familiar Ortlieb standard. I have a Peak Design Capture Pro camera clip attached to the left shoulder strap for convenience. The hip belt has short fins, again I feel with a better hip belt the pack harness would be greatly improved. Nikon D810 dslr, 20mm f2.8G, 24mm f1.4G, 28mm f1.8G, 50mm f1.4 & 85mm f1.4G lenses, Fuji X100T, various Lee and Fomatt-Hitech neutral density and graduated neutral density filters, spare batteries, memory cards and remote releases, Gitzo 1550T and a Peak Design Slide camera strap. Materials and construction are substantial, the shoulder strap attachments are bolted on. Potential heavy loads have been considered here, although a single row of stitching on the shoulder strap webbing lets things down here. This should be much more reliably bar-tacked in my opinion, although I cannot see any signs that the stitching is likely to part yet. As supplied, there aren’t enough dividers to set up the bag properly for my needs. I resorted to cannibalising an old LowePro bag to create enough compartments for cameras and lenses. Ortlieb, you need to take note of Think Tank when it comes to providing adequate dividers! Otherwise, the supplied dividers are well padded and do their job in giving the correct shape to the bag. The zippered mesh pocket in the back of the tripod carrying flap is useful but is obviously not waterproof. As fully packed for my travel and landscape photography needs. The mesh pockets in the lid are very tight and will not accommodate anything much thicker than memory cards and carpark tickets. I keep a Peak Design hex key and a couple of spare Peak Design Anchor Links in them. The elasticated chest strap is fully adjustable for up and down as well as width and also has an integral distress whistle. Materials are of customary Ortlieb high quality. Exterior zippered pocket on the tripod carrying flap is useful for keys and coins etc. Being mesh at the back, the pocket is not waterproof. The main entry zip is a waterproof Tizip, as often found on drysuits. It needs lubricating periodically to prevent wear. Waterproof Tizip seals against water, even during brief total immersion. Carabiner-style attachments for quick removal of shoulder straps. A point to note is that the Tizips need an additional tug to close the last 8mm for complete waterproofness. The base of the bag is protected from abrasion by the tripod carrying flap and there four ‘feet’ built into it. The Day-Shot does stand upright when set down on a level surface! The upper contents removed to show how I’ve used additional dividers to create more compartments. Gear attachment points on the sides would need Velcro straps of Ladderlok buckled straps to carry walking poles or a cagoule etc. Optional Ortlieb pockets for carrying batteries and other bits and pieces would be a very useful addition here. Top ‘shelf’ dividers removed to show how I have configured the camera and lens compartments. All are a good tight fit with no movement of the camera or lenses. Two tripod legs slightly extended to improve the stability of the tripod carrier. So far, the Ortlieb Day-Shot waterproof camera backpack has performed adequately well. In the six months I have had it, it’s been to the Colorado Rocky Mountain National Park and The Great Dunes National Park, Dingle & Kerry, Killarney National Park, Snowdonia, La Gomera, Skye, The Peak District, Cumbria, Dartmoor and Cornwall. It’s been out in torrential rain, snow, freezing temperatures at 11,000′, thick Calima airborne Saharan dust in The Canary Islands, been set down on the wet sands of Inch Strand and Coumeenole at low tide and in the peat bogs on numerous ‘soft’ Irish days, too. It hasn’t ever leaked, not even a tiny bit. Like any other camera bag, The Ortlieb Day-Shot is far from perfect. The carrying harness isn’t the best and the tripod carrying system is worse still. However, the materials and workmanship are as good as Ortlieb products ever were and when all is said and done, it has proven to be waterproof, sandproof and dustproof and those were my primary requirements. It fits most airline cabin baggage rules and it swallows a good amount of photographic equipment. Would I buy it again? Yes, but I wouldn’t pay the current full RRP for it, I’d search around and buy it again as a relative bargain. That way, it’s shortcomings are much easier to bear. It’s a good, basic waterproof camera backpack and with a little more effort, particularly on the design of the harness, it could be a great waterproof backpack. It is definitely waterproof and fully functional, though, and that’s what really counts in this context. A couple of smaller bags from Orlieb that are worth consideration are the fully waterproof Aqua Zoom and Aqua Cam bags. The Aqua Zoom is designed for a single camera with a short zoom attached and the Aqua Cam can hold a smaller camera, such as a mirrorless body with a couple of extra lenses or a M43 camera with two or three lenses. I have used both of these extensively and they have proven to be very reliable , durable and give excellent protection against dust, sand & rain etc. It was a sad day when CCS ceased manufacturing what I consider to be some of the best camera bags. 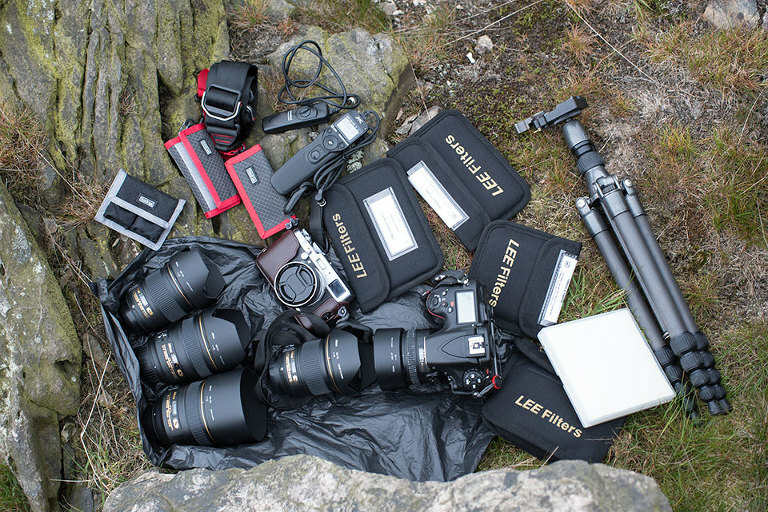 I have owned several CCS camera and lens bags throughout the past three decades and they are all still used frequently, have all been subject to rigorous use and widely travelled. They are all still in very good condition and continue their intended use without any problems to report. If I am traveling ‘light’ with just my Fuji X100T or Leica MP with up to 4 additional lenses and a few rolls of film, these CCS lens pouches on a CCS Better Belt are a good, practical alternative to a shoulder bag or backpack. CCS bags and pouches are not waterproof, they will absorb rain and leak eventually, if venturing into wet regions it might be a good idea to pack a few small Exped drybags to protect cameras and lenses whilst inside their respective CCS pouches. All remaining stocks of CCS bags were bought by RK Photographic who have been selling them off steadily ever since. There may be a few new items still available, so it is worth contacting RK Photographic. All the bags and pouches are simple and functional designs made from top quality materials. These small lens and compact camera pouches are also a very good means of protecting equipment from camera-unfriendly gear such as stoves, pots, tentpoles etc whilst stored in a daysack or backpack. The larger pouch on the left will take my Leica MP with a collapsed 50mm Elmar-M f2.8, with a 35mm summicron f2 asph without the lenshood attached, or with a CV color-skopar 28mm f3.5. Depending on whether I take just one camera (Fuji X100T or Leica MP with 50mm Elmar-M) or the MP with additional lenses and film, I add from 1-4 CCS pouches to the belt. I’m a great believer in the ‘less is more’ theory and I don’t like carrying any more than I know I will need. CCS camera and lens pouches are the most versatile and useful products I have found and suit my requirements far better than many alternative solutions. b. the zips are concealed when the pack is worn, which I feel enhances security from unwelcome attention. As in the image below, the Flipside 300 is capable of taking quite a load. In this case, there is a Hasselblad 503CW with metering prism, Cfi 80mm planar f2.8, Cfi 50mm Distagon f4, Cf 150mm Sonnar f4, 2x A12 backs, 3x lens hoods, Hasselblad strap, Lee filter adapter rings, cable releasem bubble level, unjamming tool, 3x propacks of 120 film and a Sekonic L308 light meter. 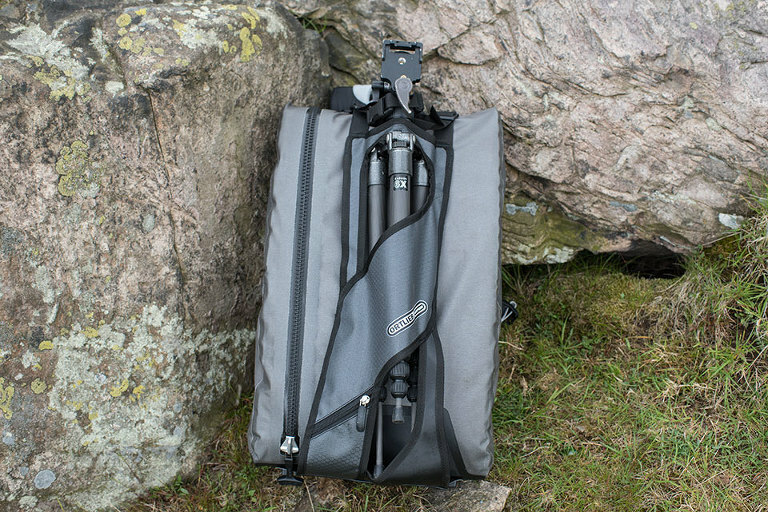 My Gitzo Traveller is held securely on the outside with a strap and buckle and a pocket for the tripod legs which can be tucked away in it’s own Velcro-closed space when a tripod isn’t being carried. The shoulder straps are adjustable and padded and the back is well padded and ventilated, with a quick-drying mesh outer. There are also adjustable chest and waist straps to aid stability. I have always found the Flipside 300 to be a comfortable carry and have used it for wedding photography commissions abroad and Wild Light workshops and holiday tours. The Flipside 200 & 400 are sized accordingly and from my experience this Flipside 300 complies with all airline cabin allowances. It’s a great choice, and for a reasonable cost you get good quality materials and the usual LowePro attention to detail.